Current World Full Beard Champion, Jeff Langum’s beard is no joke. Have you seen that mane? A Voorhees, New Jersey resident, Jeff is also a giant in the Philadelphia bearding scene. His beard is easily considered one of Philadelphia’s ‘Phinest’ treasures, in the mix with the Philadelphia Phillies’ Phanatic, the word “jawn,” pronouncing the word “water” like “wooder,” and the home of a bell with a giant crack in it. 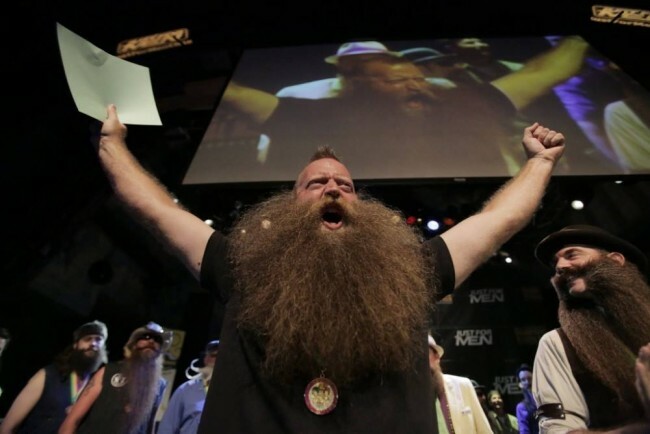 But it’s clear to see that Jeff’s extraordinary mane eclipses all of these things, bringing him international recognition, top prize at the World Beard & Moustache Championships in Leinfelden-Echterdingen, Germany, and a Guinness World Record. Jeff is a huge part of the Beardilizer team, and we recently picked his brain about his beard, when he started this mighty journey, how he stays in touch with his beardy roots, and how Beardilizer has helped him gain so much facial success. Last week, we wrote about celebrating World Beard Day and the clubs around the world that get together to do all things beardy. Beard social networking is critical, after all. How else are you going to carpool to all those conventions and competitions? Jeff told us about the Philadelphia Beard and Mustache Club, his home team so to speak. The club started out with three guys getting together since they felt that there needed to be a more unified beard presence in the city of Brotherly Love. The group meets twice a month at a bar with a name only fitting for a beard club (Tattooed Mom) and welcomes all facial hair enthusiasts. They have a slogan, which is not at all appropriate for print, however it embodies that certain Philadelphia spirit. Jeff added that the club would prefer to keep things G-rated and that shaving is for those lacking in patience and discipline. That’s a slogan that should be etched in wood over every bearded man’s door! Jeff told us that he started growing his beard out in 2011 (that’s only four years!) and knew very quickly that something about his beard was above the competition’s in both a literal and metaphorical way. Jeff’s beard grew very wide on the sides, taking a shape not unlike that of a lion’s mane. Thus, the “Langum Lion” was born. Jeff began entering into competitions not out of a desire to win, but instead, he just wanted to meet people and connect through a shared love of bearding. Winning would just be icing on the cake, and it actually took seven attempts before Jeff’s soon-to-be-legendary beard would bring home the bacon. 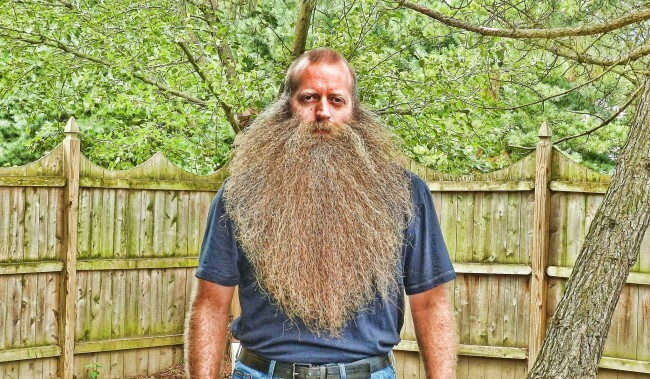 In 2012, he won his first beard competition. While the competition was small and somewhat local (New Jersey) his beard stood out in the crowd. Just like any athlete, a beard with natural talent stands out early in its career. Well, Jeff’s beard certainly did just that. It’s only been four years but there is so much to see. Naturally, Jeff uses a Beardilizer product to maintain his situation and promote growth. Jeff’s beard, just like any one else’s has areas that need additional help. He told us that his mustache has dramatically changed since he started using the Beardilizer supplements. Beard clubs are a huge part of how bearded people can stay in touch with each other. Take a look at the PBMC website. It sounds like a bunch of guys who get together, hang out at a pretty cool bar, play some bingo, and support each other. Growing as a community might not promote beard growth as much as one of the Beardilizer supplements, but it definitely doesn’t hurt. Check out Jeff’s favorite product line.